Residents of a village in Kenya decided to give Kenyan politicians a taste of their own medicine so they served them dirty water. 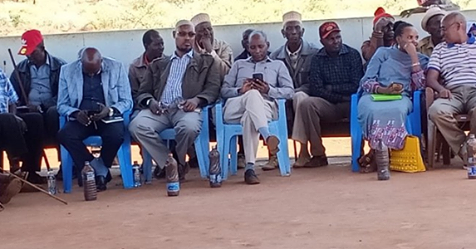 Marsabit county residents, during a scheduled meeting with their leaders on Tuesday, February 12, served muddy drinking water as refreshment to the politicians who failed to provide potable water for them. The dignitaries were comfortably seated on plastic chairs for the meeting with residents of Karare ward when Karare Ward women stepped out and served the political and administrative leaders who were in attendance bottled muddy water. The politicians tried to pretend they didn’t see the water and continued chatting with one another. But their bottled muddy water was carefully placed on the ground beside them. The residents of Karare area were angered that their leaders had failed to come up with a solution to their perennial water problem. The water the villagers use for cooking, drinking and cleaning is contaminated and completely unfit for human consumption and they wanted to give their leaders a rare chance to see the kind of life they live.